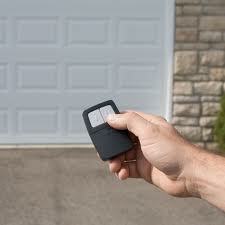 Do you need to urgently replace your garage door remote clicker in Oakville, Ontario? We can supply you with a new one from any brand. Want a universal clicker by Liftmaster? Need to find the best remote for your Craftsman opener? Whether you want a regular multi code clicker or a smart remote by Genie, our company can provide you with the best remote controls on the market. When there is such an urgent need for fast garage door remote replacement in Oakville, we respond quickly. Is the original clicker stolen? Our first job is to erase the stolen clicker’s code. And then we program the new one. When it comes to any need related to the transmitter, trust the speed and efficiency of our Oakville Garage Door Repair team. Garage door clicker problems create insecurities and problems. Not only won’t you be able to open the overhead door from outside but you might also be confronted with more problems. Sometimes, clicker issues are caused by the reverse system or antenna. Our pros respond quickly to check, troubleshoot, and offer solutions. We can fix any problem with either the opener or clicker and make the required adjustments and repair work in no time. Customers can rest assured that all technicians in our company are updated with the garage door remote innovations and can take care of any branded clicker. If the battery is not the problem, then it is definitely a problem with either the opener or the mechanism of your garage door remote clicker. And that’s what we find out by checking both. Our techs are prepared to fix any problem with either mechanisms and do so with respect to the specs of the opener system. If the problem cannot be repaired, the clicker is broken or lost, or you simply want to get a new remote control, we are here to provide you with a new one. Whether you want a new transmitter or to fix the problem with the existing Oakville garage door remote clicker at your home, give us a call.